Tuberous begonias are flowering plants that grow between 12 and 18 inches tall. They produce showy blossoms that are available in various forms and colors. Tuberous begonias are susceptible to a number of foliar infections, including powdery mildew. Powdery mildew is the most serious disease of tuberous begonia plants. The fungus that causes powdery mildew infections is plant-specific; it cannot pass from begonias to other plants such as roses or lilacs. The pathogen spends the winter in diseased leaf litter or on infected foliage. It matures during the spring and sends spores into the air. The wind carries the spores to new plants to create new infections. Powdery mildew infections begin as circular white spots on leaves. The spots grow together until they cover the entire leaf in a dust-like coating of fungal matter. Small black fungal spores appear in the fungal growth. Infected leaves lose their color, curl up or distort and fall prematurely. The disease rarely causes serious harm in most species; tuberous begonias, however, may become so weakened by the infection that they do not survive the growing season. Powdery mildew infections are less prevalent in conditions where plants receive adequate air circulation and full sunlight. 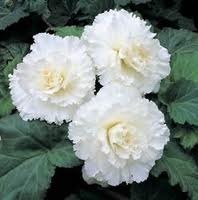 Planting disease-resistant varieties of tuberous begonias also helps reduce or eliminate powdery mildew outbreaks. Spraying plants at timed intervals with an appropriate fungicide prevents infections from occurring.